Extended Rides: Warning: these rides are not "Activate sponsored Health Rides" although they are healthy! Ride Leaders have agreed to plan a route and guide others round but each rider is responsible for their own and others’ safety at all times. Anyone intending to join a MCG ride must notify the Ride Leader by the cut-off date indicated in the ride details. If last minute circumstances dictate that you cannot attend, please inform the Ride Leader. Lunches: are normally ordered through the 'leader'. If, for any reason, you are unable to ride that morning then it is your responsibility to contact the 'lunch stop' directly to cancel your lunch otherwise you may be liable for the bill. Most rides start at 10:00 a.m. and are designed to last around 2 hours perhaps covering 15 to 20 miles. Rides are using mixed terrain: some road, some off road (bridleways) and with a mixture of small climbs but nothing a competent cyclist couldn't manage. As for any cycling, helmets are strongly recommended as is the provision of plenty of water to drink. Occasional hazards, eg ruts or potholes. May have some significant gradients. Steady pace. Distance not a problem for most but confident bike handling required. Contains challenges or difficulties which make the ride unsuitable for many. Somewhat demanding and with a brisk pace. Monday 29th April - New Forest - John R: Passing through Linwood, going out to Frogham, over the ridge to Fritham for a coffee break before returning via Janesmoor Pond. A total of approximately 21 miles on tarmac roads and gravel tracks in the forest. Lunch available on return. Please register with John. Monday 29th April - Bluebell Run - Anita: A repeat of a previous run out to Garston Woods to walk and view the bluebells. Easy riding. Please sign up with Anita if interested. "This ride is now full." 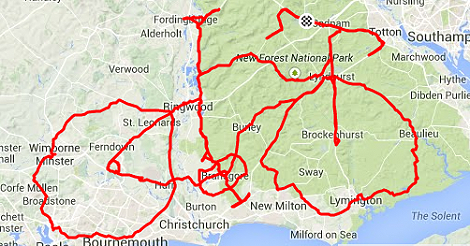 Monday 3rd June - Ringwood/Verwood - Brian J: Circular route from Ringwood to Verwood for coffee and back for lunch. A mix of road and gravel route we did in 2016. The pub will require the food order a week before the ride. For further details and register with Brian, please. 2019 - You can register for the ride two weeks leading up to the preceding Friday. 08 Jul - ? - Brian M - Red - ?